Spaceflight Operations presents a unique range of challenges unlike those found on earth. Time, distance, and the remote environment provide a unique opportunity to assess planning, training and operations of the integrated crew ground team. Leadership, trust, values and teamwork provide the foundation for the compelling story of early space missions concluding with the rescue of the Apollo 13 crew after an oxygen tank exploded with the spacecraft 200,000 miles from earth. The story concludes with a summary of the technical cause of the explosion. Like an aircraft accident, the Apollo 13 tank explosion required a series of apparently unrelated events none of which by itself would have caused the failure. Eugene “Gene” Kranz was born on August 17, 1933, in Toledo Ohio, and received his BS Degree in Aeronautical Engineering from Parks College of Saint Louis University in 1954. He was commissioned in the U.S. Air Force in 1954, and flew jet fighter aircraft including the F-80, F-86, and the F-100. In 1958 he served as a Flight Test Engineer at Holloman AFB, New Mexico, for McDonnell Aircraft developing the Decoy Missile systems for the B-47 and B-52 aircraft. He was discharged from the Air Force Reserve as a Captain in 1972. In 1960, Mr Kranz joined the NASA Space Task Group at Langley Virginia and was assigned as Assistant Flight Director for Project Mercury. He assumed Flight Director duties all Project Gemini Missions. Mr. Kranz was selected as Division Chief for Flight Control in 1968, and continued duties as Flight Director for the Apollo Program. He was the Flight Director for many Apollo missions including the Apollo 11 lunar Landing, and he led the “Tiger Team” for the successful return of the Apollo 13 crew. He performed as Flight Operations Director for the Skylab program, and, at its conclusion, was assigned as Deputy Director of Flight Operations with responsibility for space flight planning, training, mission operations, aircraft operations and astronaut operations. In 1983, Mr. Kranz was assigned as Director of Mission Operations with responsibilities for all aspects of mission design, testing, planning, training and spaceflight operations. Additionally he was responsible for the design, development, maintenance, and operations of all related mission facilities, and the preparation of the Shuttle flight software. In this capacity, he was responsible for over 6000 employees with an annual budget of approximately $750 million. Mr Kranz retired from NASA in March 1994 after 37 years of federal service. Current activities include motivational speaking to professional, military, and civic groups. He served as a Flight Engineer on a B-17 “Flying Fortress” for five years. Mr. Kranz is a co-recipient of the Presidential Medal of Freedom awarded by President Nixon for the Apollo 13 Mission, and was designated a Distinguished member of the Senior Executive Service by President Reagan. 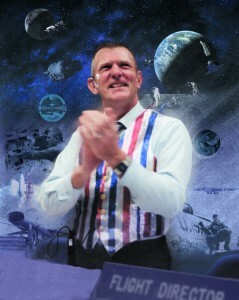 Mr. Kranz was the author of the “Spaceflight” section of the 1984 and 1988 World Book Encyclopedia. Mr. Kranz is a New York Times best selling author. His book Failure is not an option was published by Simon and Schuster in April 2000 and in paperback form by Berkley Books in 2002. The book chronicles his work in Mission Control from Project Mercury through Apollo 13 and beyond. The book was selected by the History Channel as the basis for two documentary programs on Mission Control broadcast as two-hour specials in August 2003 and 2005.